I’m Sewing My Stash By Having a Pajama Party! My fabric has started to take over my sewing room. This is a problem because my sewing room is really the formal dining room in my house, so it’s a very public room! I tend to buy nice fabric and then…hoard it. Yep, I don’t want to use my precious x, y, z fabric because I really just like to look at it?? Hello, I’ll just put that quarter in the therapy jar! Anyway, moving on! When the Pajama Party Blog Tour came up, I knew I’d love to be a part of it because one thing that I love making out my favorite fabrics is PAJAMA PANTS. Mustaches in organic knit from Birch Fabrics? Check. Custom print mermaids? Check. I do it ALL the time because (hopefully) I’m not going to grow out of my favorite pajama pants! 🙂 I get SO much joy from putting on these pants too. And, seriously, have you sewn a pair from cheap interlock from JoAnn’s and then sewn up the same pattern in something much nicer (like the Birch knits)?? While I love a good sale, I also know that more often than not, I get what I pay for! So, I started planning all of my pajamas when my 9 year old started showing more interest in actually following a pattern. In the past, she has sewn little bits of scraps together and made clothes and stuffies for her dolls, but she hasn’t really been interested in following a pattern. 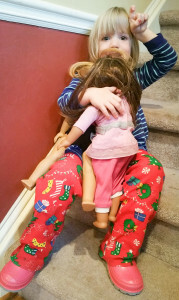 After being inspired from a picture one of our members posted in the Facebook group that showed a bunch of students sewing up our free pajama pants pattern for their mother’s day gift, I brought up the idea to my daughter and she jumped at it. 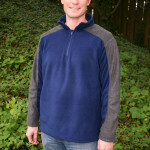 The Versatility Tank and Pants (for women and kids) is such a quick pattern! 3 seams and you’re ready to put the elastic (or yoga band) on the pants. It took longer for my daughter to tape the pattern together and cut it out than it did for her to sew it. She picked out a super cute panda print from my stash and a lime green contrast for her yoga band. She was a little nervous with my new serger, so she opted to sit in my lap while I explained everything to her. Today, she was in there making baby doll clothes without any assistance from me! In the end, she was thrilled with her new pajama pants and very proud of doing it by herself. Her new pants led to the other kids picking out fabric. I let the twins “help” by sitting in my lap while I sewed theirs up. 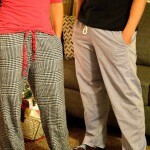 They both picked Christmas fabric and then rocked their new pants during daylight hours. (They are beacons of fashion. I don’t dress them!) 🙂 As soon as any of them tried their new pants on, they wouldn’t take them off again to let me hem them! I implore you to share your love of sewing with your kids, grandkids, neighbors, schoolkids, anyone really. I find sewing to be such a meditative time for me. While my daughter still gets a little stressed out by failing (today the serger cut into the shirt she was working on), she is learning to stick with it and keep trying. Thanks for taking the time to read! Don’t forget to check out the other stops on the blog tour and enter the giveaways! So cute! It’s awesome that your 9 year old sewed them up herself! I’m trying to get my 6 year old interested but she gives up easily when she gets frustrated. My girls are little “beacons of fashion” too, lol. Thank you for taking part in the tour! Oh I so get the need for a clean sewing room! My sewing area is the living room which is all part of one big room with the dining room. No hiding the mess from guests! 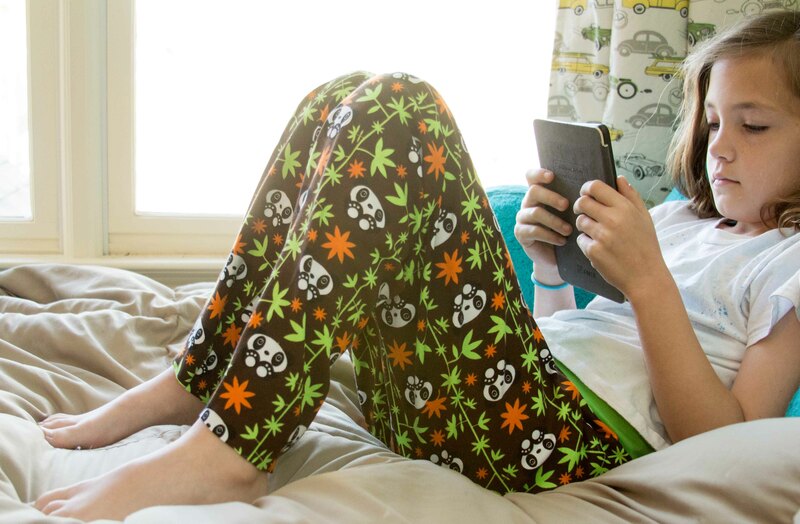 I love those brown and green pajama pants! Your 9 year old did an awesome job! 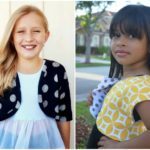 I have an 8 and 11 year old (both girls) that love to sew. My 2 younger daughters are getting into it too but don’t really use the machine. I love that they picked out Christmas fabric and you went with it! Way to go! How sweet that she made them herself! Very impressive! Love this! Your daughter did a wonderful job! it’s so awesome to be able to share our love of sewing with our kiddos. I have just started with my own daughter. She’s 4 & sits on my lap to stitch some. 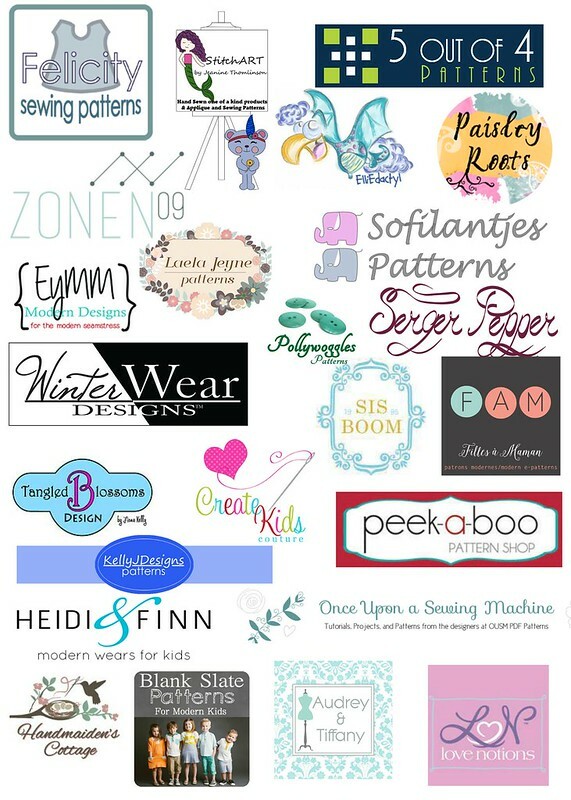 This inspires me to introduce PDF patterns to the kids in my sewing class! Thanks. My daughter is currently learning how to sew, pjs might just be the perfect beginner project! I have a huge stash problem as well. Mine is all in storage at the moment and I really, really need to start sewing again so I can use up some of it. How fun! My daughter is 8 and we have been slowly working on teaching sewing with her.